Symphony No. 2 in C Minor, “Resurrection,” by Gustav Mahler is as big as its name. The massive work, which the Evanston Symphony Orchestra will play in its last concert of the season on June 11, is grand in all directions: scope, intensity and length. Gustav Mahler was born at Kalischt near the Moravian border of Bohemia on July 7, 1860, and died in Vienna on May 18, 1911. Mahler originally wrote the first movement of his Symphony No. 2 in 1888 as a “symphonic poem” entitled Todtenfeier (“Funeral Rites”). He wavered for five years about whether to make Todtenfeier the beginning of a symphony, and it was not until the summer of 1893 that he composed the second and third movements. The finale and a revision of the first movement followed in the spring and summer of 1894. Consider for a moment the film Star Wars, one of the most popular and highest-grossing movies ever created. Now think about the film without its score. Not so easy to do, right? The iconic music from Star Wars, which features such movements as “Princess Leia’s Theme,” “The Imperial March” and “Yoda’s Theme,” is one of the most well-known and played pieces of movie music in the world. 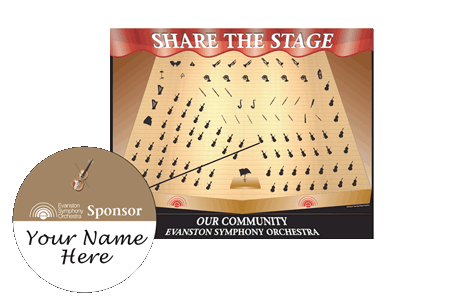 Fortunately for film buffs, the Evanston Symphony Orchestra will be playing the suite in its entirety at its May 7 concert. Rachmaninoff’s works have inspired many Hollywood soundtracks, so it is fitting that his Piano Concerto No. 3 has itself played a central film role. Shine, the 1996 movie based on the true story of Australian pianist David Helfgott, depicts the life of a piano prodigy pushed to perfection by his domineering father, and driven to madness by the technical and emotional demands of the “Rach 3.” The film earned praise from critics and audiences alike, and an Oscar for lead actor Geoffrey Rush. It also renewed interest in Rachmaninoff’s technical tour-de-force. Read more about The Incomparable "Rach 3"
Sergei Prokofiev was not an obvious choice to compose the score for Lt. Kije, one of the earliest Soviet films. In 1932, he had not yet composed his more popular works, Romeo and Juliet or Peter and the Wolf. When approached by the film studio, Belgoskino, in 1932, Prokofiev saw it as a way to reach a wider audience, thanks to the international distribution of the film. March opens with another blockbuster Evanston Symphony Orchestra concert featuring Hector Berlioz’s Symphonie fantastique and Frederick Chopin’s Piano Concerto No. 1 in E Minor featuring pianist Sean Chen, third-prize winner in the 2013 Cliburn Competition. There is still plenty more in store, however, during this 71st season of the ESO. The second concert of the 2016-2017 season features works composed during a time of great upheaval. In 1830 revolution was sweeping across Europe, and artists of the time were no less revolutionary in their creative output. Hector Berlioz’s Symphonie fantastique was unique both for its autobiographical narrative and for its brilliant expression of the story’s many shifting moods. This musical drama truly embodied the Romantic era belief that music had the power to express pure emotion. Born in what was then the Duchy of Warsaw, Frederic Chopin was playing the piano and writing tunes by the age of 6. At age 8, he was performing in elegant salons and writing his own compositions including the Polonaise in G Minor.